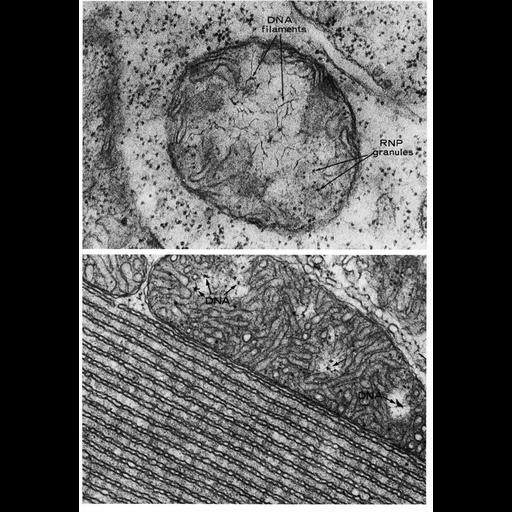 Figures 226 (upper) and 227 (lower) from Chapter 7 (Mitochondria) of 'The Cell, 2nd Ed.' by Don W. Fawcett M.D. Examples of mitochondrial DNA from a plant cell (Vicia faba), and from the snake adrenal gland, where the mitochondrion is adjacent to a highly ordered array of endoplasmic reticulum. Images by Hewson Swift (upper) and John Long (lower). A PDF copy of the accompanying chapter is available on the ASCB’s BioEDUCATE website. Fawcett's "The Cell" 2nd Ed.